Due to a tragic accident, Banri Tada is struck with amnesia, dissolving the memories of his hometown and past. However, after befriending Mitsuo Yanagisawa, he decides to move on and begin a new life at law school in Tokyo. But just as he is beginning to adjust to his college life, the beautiful Kouko Kaga dramatically barges into Banri's life, and their chance meeting marks the beginning of an unforgettable year. Episode 1 was previewed at a screening in Tokyo on September 23, 2013. The voice actors for the anime reprise their roles in both the 2013 drama CD and web radio. It makes me sad to see such negative reviews in the two review spots. This is definitely one of my favorite romantic anime out there. Yes, the whole amnesia plotline is rather wonky. Yes, the characters can be a bit overdramatic (although honestly, it's nothing I haven't seen in real life). But what really gets me is people claiming this show lacks depth. I firmly believe that this show has some of the most well-written characters I've ever seen. In fact, I think the people saying this show lacked depth just missed all the nuances (which, granted, were at times hard to see. But once you saw them you were blown-away.) Unlike most romance stories, where the plot is "will the characters end up together? ", and then ends with a "yes!" and a happily ever after, Golden Time's plot is two people working through the relationship, and realizing that there isn't a happily ever after. I found that really refreshing. I'll admit, at times the plot is so character-driven and lacking of actual motion that it feels like nothing's happening. And when it comes to the actual plot with Banri, there are many episodes where the problem could easily be solved by Banri just talking to his friends. But on the other hand, when it comes to his relationship with Koko, when there's a communication issue, the two will usually have the conversation you wish they'd have. And as someone who focuses mainly on character writing when watching/reading something, the way the two of them were handled was really all I needed in this show. The ending, I admit, was fairly disappointing. They crammed into one episode what they should have put into at least two. And when I first finished watching it, I felt like they hadn't answered the main questions at all. Particularly with Linda - but it was only after I'd sat and thought about it for a while (particularly with some symbolism through tennis shoes) that I understood their answer. Yet there were many other characters whose plotlines got vague symbolistic answers, and you just sort of had to accept that. And with Banri's whole amnesia thing... I found it a bit ridiculous, so I decided to interpret it as past self v present self, with the amnesia creating a more defined divide between the two. And then it made a bit more sense for me, as well as was more tolerable. Oh, and a quick other note - the voice acting, especially on Horie Yui's part, was amazing. There were literally some scenes where I just thought "DANG that's good acting", as dumb as that sounds. The OD/ED were both forgettable, unfortunately. I actually skipped the 2nd OD most of the time because I couldn't stand it. And while the music isn't a big problem, having songs I can add to my anime playlist is always a big bonus. Also, the art, for an anime, is perfectly fine. The OD/ED both have some great scenes, but I always skipped them, so... From what I've seen of the manga, that has truly great art. Overall, I'd say, if you're not willing to put in the mental work to really understand this show, don't bother. Not that it's a ton, but... basically, if you're looking for a light, fun show that you can watch while doing other stuff, Golden Time is not that show. But a lot of the answers you need to be satisfied, you have to come up with yourself. The hints and tools you need to get there are all provided for you in the show, but you have to keep an eye out for them. Otherwise this show can easily come off as two whiny, overdramatic college kids who cause their own problems. Every once in a while, you watch something bad that doesn't feel like a total waste of time, because it's just so bad that you learn from it exactly what you never want to see from any form of media again. Or teaches you exactly what NOT to do if you write something yourself. Golden Time was honestly such a terrible experience that it was almost rewarding. The entire show was like an empty shell; you could keep looking long and hard for a pearl as much as you wanted and nothing but disappointment would surface. I give them credit for at least trying to escape the ordinary by setting the whole thing in a college instead of a high school, but in the end the scarce focus on the setting and the way the characters behaved like incomprehensible children instead of young adults made it all pointless. The use of tons of romcom cliches (amnesia as a plot device, sad childhood friend, half-assed love triangle, misunderstandings as source of conflict) was constant and just as poorly done as the attempts to make the whole thing stand out from other bad, stereotypical romcoms. The entire plot revolved around Banri's amnesia and his relationship with Koko, with no focus or backstory for the side characters and relationships at all. Not only the whole thing got excruciatingly tiresome after a while, but it was clear that there wasn't enough of it to fill 24 episodes: the conflict dragged its feet for much longer than necessary, and there were lots of episodes that were so useless you could just cut off entirely and it would make no difference. They started to appeal to source of new conflicts that were so silly and uncalled for it was impossible not to question what the hell the author was even thinking. Also, the main conflict itself was done in a way that made it completely unappealing and dull; It's especially notable how they made Banri's "past self" a literal ghost that follows him around sulking, which let's face it, makes it hard to take everything seriously. Not to mention that they asspulled the most boring, predictable conclusion they possibly could for this storyline right on the last episode. Amnesia is a cliché that may work if done right, but in Golden Time it isn't compelling at all. Moreover, the main couple's relationship and scenes were absolutely unnatural, forced and cringe-worthy. The show gives them no time to develop feelings for each other, forcing them together 6 episodes in. Their personalities don't mash at all, making all of their interactions feel extremely awkward. There was no enjoyment whatsoever in seeing them interacting, no heartstrings pulled, no fun, no cuteness, nothing. It wasn't organic, or realistic, and it sure as hell wasn't convincing. It just fails into delivering. The main problem with Golden Time's writing, though, doesn't even lie on the awkwardly put together plot, no. It's on the characters. It's no exaggeration to say that Koko and Banri are among the worst leads in any romance anime I have ever seen. Banri is absolutely plain - no distinguishing personality traits, no quirks, no ideals, no goals, NOTHING about him is interesting. He's the boy with amnesia, boyfriend of Koko, and nothing more. He's just there. The fact that he lost his memories is really no excuse for his boring character either - come on, even Elfen Lied's Nyuu had more personality than this guy, and she didn't even remember how to go to the toilet. Koko, on the other hand, is painfully unlikeable. She's an annoying cheeky brat who's always causing trouble and victimizing herself. Right off the bat she's shown to be stalking her childhood friend and wanting to force him into marriage, and then screams at him and acts like a vulnerable damsel who has been wronged when he shows to be uncomfortable and creeped out. Once she engages on her relationship with Banri and shows a kinder side and some acceptable character development, she becomes considerably less unlikeable, but still annoying, to the point where I caught myself thinking "Of course she's with him, only some boy with zero personality and sense of self would willingly spend time with this girl". It's that bad. And because of this, whenever the drama kicked in, it was really hard to care. Why should I? How can the viewer possibly relate with these two? Why would I get sad over characters who keep acting like dumbasses instead of like sensible human beings? The other characters are barely worth commenting, with maybe the exception of Linda, Banri's senior and friend. She is infinitely more likeable than Koko, but her role in the story is confusing and unclear - is she supposed to be another end of a love triangle? Is she in love with him, is she jealous? Is her relationship with Banri only sister-like, and she really doesn't see him as more than a friend? We don't know (at least not until the final ten minutes of the last episode in a really plain and threw-this-scene-in-for-the-sake-of-explaining-her-feelings development - oh, well). Aside of Linda, the side characters might as well not even exist. Literally - and I mean that - every dialogue they have among themselves is about the main couple. Their personalities are pretty much non-existent, and the sad attempts of giving them some depth of their own are so fribble it's laughable. They're only there to talk about the main couple and act like idiots on their own accord. The art and animation are savorless. It's pretty below average and there's nothing special about it, except if you count some dramatic scenes that were animated so exaggeratedly that became hilarious. The character designs are pretty flat and unoriginal, Koko looks pretty much like a grown-up Aisaka Taiga. The music isn't noteworthy either - Horie Yui did a good job voicing Koko, Kayano Ai's voice is cute as usual, but that's about it. Golden Time was definitely not an enjoyable experience . Watching it every week felt like a task and I got bored regularly. But at the very least, it definitely reminded me of some of the things that can make a story dreadful, and taught me to avoid it. And maybe next time I watch a good romantic comedy, I can think back to this show and enjoy the good aspects of whatever I'm watching at the time even more. Story: 3/10 - Empty, poorly written. Drags its conflicts for more time than necessary, doesn't know how to distribute its focus, suffers from melodrama. Art & Sound: 4/10 - Below average. Characters: 3/10 - Act stupidly for the plot's sake, are either unlikeable or have no personality at all, questionable character development. Golden Time is something that tingles in my mind for a few days after i watched it. Back in the November, i was already put Golden Time in my plan to watch, since so many sites recommend that this anime is your-must-watch anime in winter season and so after it has finished aired, i watched it and i must say i have a really "golden time" when watching it. As far as you can see, Golden Time is labeled with comedy and romance genre. The genre that we often said as the most generic in anime industry. JC is one of those production house that often adapting romance-comedy manga into anime, Bakuman and Ano natsu is one of their success romance comedy anime. But how about Golden time? Golden Time is anime that must we consider where romance-comedy anime is not all about cliche and the endless loop "would they be date or not". There is so many things that makes golden time is a worth anime to watch. One of those is how the story goes. The plot moves smoothly and with the narration giving a sense that Banri is showing and telling the story, its really make us understanding what Banri are thinking. Golden Time is like a puzzle, each episode provide us a single piece that if we're combining all of them would make the completed one and so this one. This basically because Golden Time focussing on how Tada Banri collected his lost memories and how his amnesia affecting the people surround him including his friends or lover. And so we would be presented so many flashbacks that would tell how he was in the past including how he have forgotten the life before amnesia. As i said before, Golden time is like breaking the endless loop of “would they be date or not” . In this anime, we would see a progression of romance relationship. This is not merely they would lovey dovey all the time but we would see the struggle and obstacle between them which is nice and represents how life is not always easy and there would be always some obstacles that blocks our way. Other things that makes golden time interesting is the comedy. The humor primarily comes from the interactions between his friends and minor characters, In this anime we would see a comedy that basically happen in our real life like how we get pranked by our seniors when just enrolled in university or jokes that can only be understand by our circles. Golden time is realistically represent this in their show which is makes watching golden time like watching our life itself. The art in this anime is not too good neither bad. But this is suitable with the anime. The background is quite vivid and colorful. But sometimes the art is kinda messed up, like how they drawn characters sometimes the characters look so weird. JC seems like doesnt do their best in this anime, there is just so many times when the characters look bend in the other way but despite of that, it doesnt decreasing the pleasure from watching this anime. The sound in this anime is amazing, first from the seiyuu parts we would find a few famous seiyuu like Yui Horie as Kaga Koko or Ai Kayano as Linda, of course the quality of them doesnt need to ask, they perfectly fit with their roles especially Yui Horie as Kaga Koko. Her sound really loveable and the phrases “oh, wow” is kinda attracting. But thats not just all, one thing to notice is how Furukawa Makoto for being Tada Banri as seiyuu. As a new comer, his quality isnt like the beginner at all. His angry or serious tone are really magnificent and really suitable with Tada Banri. Not just the seiyuu parts, the soundtrack is also good. 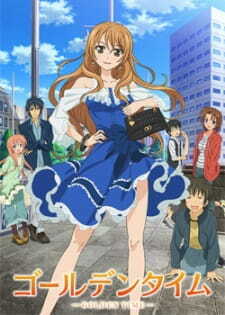 From the opening we have “Golden Time” by Yui Horie itself. The song is quite lovely and easily grasp people’s heart. There isnt any problem with their OP and ED songs, it had a really nice combination of OP/ED to start the series off which helped with that great first impression. they were particularly is suitable with the themes of love. Moving to BGM, Yukari Hashimoto is the one who responsible for this. Honestly, she is the best when it comes to romance music. His works in Toradora is enough to represent his quality and this time he also success in this anime. The BGM is really mixing well with each scenes. The other thing that is noticeable from this show is the characters or the whole cast in this anime. The entire character and cast is so realistic and full of "normal people" that would we meet in our real life not some overly attached-girl, the little sister that have a thing for his big brother, a girl who is expressionless, or anything that anime provides us oftenly. More than that, In other words, the characters feel real and human. They are filled with multiple facets and glaring contradiction, just like all of us. In the end, this anime is a good way to represent what a romance anime is. The realistic views is probably the most prominent in Golden time and i think this is how all anime should be especially when they bring ‘romance’ tags. Unrealistic romance makes the love story become cliche and good things golden time isnt like that. So, if you want a good romance with realistic, light-hearted comedy, Golden Time is probably one of the anime that you should watch. It is only natural to project grand expectations on any anime associated with a renowned classic. Penned by the original creator of Toradora!, the first six episodes had Golden Time primed as the next rom-com sensation out the J.C. Staff house. Unfortunately, the luminous promise soon became a glimmer of an afterthought. Repercussions relative to pacing, characterizations, and key revelations accumulated as the series imploded spectacularly to close out. SPOILERS onward (based on final impressions). The root to Golden Time’s problems stems from its peculiar inclusion of a supernatural element. Rather than a visible representation of this “alternate” Banri, an implied presence would have been more effective. The circumstances triggering his condition were too variable and opportune, apathetic to foreshadowing and logical parameters. Banri had been shown taking medications after and not before his first relapse, so what should have been a smooth road for the narrative instead became one scarred by potholes (plot holes). Progression between Banri and Kouko was woefully negated by incidents blown severely out of proportion. There was simply no extinguishing the fires of drama upon their ignition. With the exception of the rocker Nana, the cast was too momentum-based and capricious in complexion. Like puppets, their decisions were not made under their own accord - most notably with Oka Chinami. For someone who was once exemplified as a friendly, happy-go-lucky acquaintance to Banri, her whimsical hostility and irritability in later stages was unjustified. It was dejecting to endure the constant stagnancy and artificial pretentiousness on display, from Kouko wrecking Takaya's car (when did she acquire a driving license?) to Banri getting torched for his amnesiac tendencies. Ultimately though, the finale was most unforgivable in its blindsiding convenience and blatant disregard of prior developments altogether. I would like to bury this series in similar fashion to Banri with his past, but sadly the damage will remain everlasting. Poll: Who is the Best Girl?? Despite a wide variety of styles and settings, many of the most successful romance animes have one thing in common: they inspire us. But what is it about these shows that tugs at our heartstrings? The answer might be simpler than you think.